Ok! So this little guy has nothing to do with card making etc. but I thought he felt a bit neglected. He's been displaying 'his' ribbon on my bear shelf for a week now and all these cards have got ALL the attention. 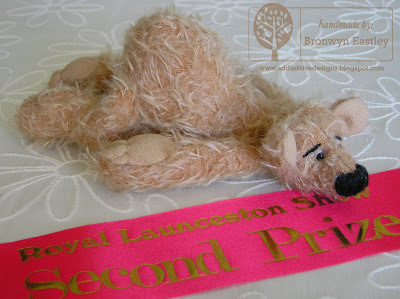 I thought it would be fun to show you my entry in the Bear and Doll section of the Launceston Show. I have not completed a bear since joining SU as I'm having too much fun with papercraft at the moment. I guess I'll get to my UFO's (unfinished objects) at some stage. Next year, I might dust off the shelf and put another couple of entries in just for fun!